Musicians have been performing at the Hollywood Bowl since its inception in 1922. "Bowl Orchestra" was used as early as 1925, and "Hollywood Bowl Orchestra" was used on live recordings made in 1928 under the baton of Eugene Goossens. From 1945-1946, Leopold Stokowski was Music Director of the Hollywood Bowl Symphony Orchestra. From the 1950s on, however, there was no official Hollywood Bowl Orchestra until it re-appeared in 1991 as a completely new ensemble. The current incarnation of the Hollywood Bowl Orchestra was established under the direction of former Principal Conductor John Mauceri and gave its first public performances on July 2, 3, and 4, 1991. During his sixteen-season tenure, Mauceri and the Hollywood Bowl Orchestra toured Japan four times and, in November 1996, performed two public concerts in Rio de Janeiro and Saõ Paulo, Brazil, representing the first time an American orchestra was invited to Brazil specifically to perform the great music of the American cinema. After retiring from the orchestra in 2006, Mauceri was awarded the permanent title of Founding Director of the Hollywood Bowl Orchestra. In 2008, Thomas Wilkins began his appointment as Principal Guest Conductor of the Hollywood Bowl Orchestra. Wilkins, committed to promoting a life-long enthusiasm for music, is an audience favorite whenever he conducts. The Hollywood Bowl Orchestra is comprised of 80 players; an international mix of classically trained musicians who are among the best studio musicians in Los Angeles. Many make their daily living on Hollywood's scoring stages and are also accomplished soloists among L.A.'s various regional and chamber orchestras. It might be surprising to learn that there is no crossover between the Los Angeles Philharmonic and the Hollywood Bowl Orchestra - another indicator that L.A. has a tremendous pool of musical talent. 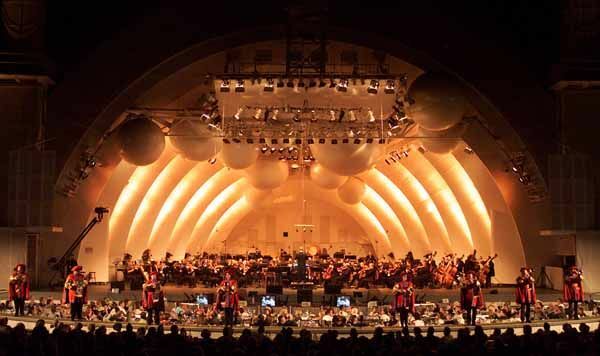 For the last two decades, Hollywood Bowl Orchestra concerts have featured an incredible variety of distinguished artists from all genres of music and the world of entertainment. From Mozart to Motown, the repertoire of the Hollywood Bowl Orchestra is as diverse as Hollywood itself. In a single season, the orchestra will perform everything from Broadway favorites to film music, pop music to jazz, and classical music to world premieres by living composers. In essence, the Hollywood Bowl Orchestra does it all.